Peter Cincotti started playing piano at the age of three, and he really didn't start singing until just a few years ago. But now at the age of 19, he is acknowledged to be a jazz quadruple threat — Cincotti is an accomplished pianist, vocalist, composer, and arranger. His debut CD, "Peter Cincotti," has already been one of the top five on the jazz charts. Already, some have compared him to Harry Connick Jr. or a young Frank Sinatra. All this from a young man that can't order alcoholic drinks from the jazz bars he performs in. 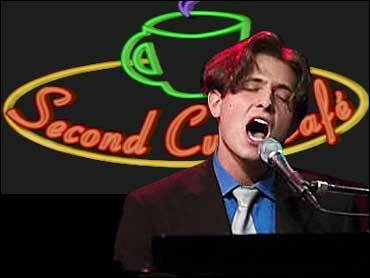 Cincotti visited The Saturday Early Show to perform some singles from his CD on the Second Cup Café. The album features three of his own compositions, some standards by jazz greats, a Beatles interpretation of "Fool on the Hill," and a little blues. Born and raised in Manhattan, Cincotti started to play his toy piano that his Grandmother gave him at three. He began composing at the age of nine. Cincotti isn't a self-taught master, but he has studied jazz piano with some of the greats, such as Ellis Marsalis, James Williams, Cliff Korman, LeeAnn Ledgerwood and Fred Hersch. And he used what he learn early. While in high school, he performed at jazz clubs, starred in the off-Broadway show "Our Sinatra," participated in the National Grammy Band, honored in the John Lennon Songwriting Contest and was invited to perform at the White House. Last year, Cincotti appeared at the Algonquin's Oak Room in New York City — making him the youngest headliner in the cabaret mecca's history. The liberal-arts student at Columbia University has also worked with some of the biggest name of jazz, pop and R&B, such as Billy Joel, Elton John, Barber Streisand, Tony Bennett and Stevie Wonder.